We have over 25 years experience in fire & first aid training and all of our trainers are FPA, CHAS, FOFATO, IFSM & CIEH professional trainers, plus they are also FETA passed. We are based in Nottinghamshire but we cover the whole of the UK for Fire Marshall and Fire Warden Training..
To make an enquiry, please email us at [email protected] , fill out the form below or give us a call on 01623 510068. Fires can happen any time, spread quickly and can become uncontrollable, so we help our customers with preventing fires and knowing what to do if a fire occurs at your premises. A knowledgeable Fire Warden / Fire Marshall will carry out many elements of a fire risk assessment, to help preventing a fire from ever happening. Our courses will make your people fully aware of the dangers of fire, understand what to do in the event of a fire alarm and how to quickly and safely evacuate the premises and account for everyone in the building including any visitors. After the course you will be fully aware of fire safety measures and fully understand the duties of a fire marshal or fire warden. Having the correct fire warden / fire marshal training to comply with current legislation is critical for you, your staff and visitors at your premises. 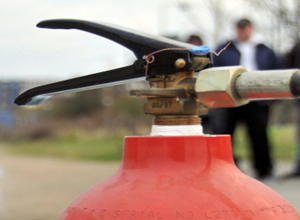 We have conducted on site fire warden / marshal training for over 25 years, and our fully qualified and insured training staff can give tailored advice to your site which you can’t get if you send your colleagues to a venue. Our professional trainers are FPA, CHAS, FOFATO, IFSM & CIEH qualified plus they are all FETA passed. Regal Fire has fully qualified and experienced trainers to help you and your company not become a government or HSE statistic because in 2014/15 there were over 170,000 fires with over 275 deaths, and with over 16.5 million pounds worth of fines to companies. Contact us today for a very competitive quotation. Imagine a fire at your premises..would you and you staff know what to do?? We are genuinely here to help, with full back up advice, so please contact us today for a very competitive quotation. J Stocks, Gibbon Inks-Alfreton, Derbyshire.